In addition to being one of the game’s most well-known tanks, Woeler develops a host of unique resources and tools for ESO’s players and community. We talked to him about one of his most recent creations in our latest Community Spotlight. You can grab the Dwemer Automation Discord bot and check it out for yourself via its official website. To get started, could you describe what the Dwemer Automaton bot can do in layman’s terms? The Dwemer Automaton is a multi-functional Discord bot specifically designed for Guilds and communities in The Elder Scrolls Online. It has various commands that allow users to fetch game-related information like set or Skill information, price checks, and pledges among many others. It also allows server administrators to subscribe to various news channels like pledges, official ESO news, and patch notes. This way, you will never miss an ESO announcement. What inspired you to create this tool for the ESO community? What separates the Dwemer Automaton from other, similar Discord bots? This would be two aspects that are locked in a vicious circle. First would be data completeness. It knows all the sets, skills, Crown Store items, Guild Store item prices, etc. The second point would be feature richness. And as I said earlier, these two are interlocked. A big set of useful data allows for the implementation of many features. What has been the reaction from the ESO community since its release last year? Very positive. There have been many celebrative comments on Discord, Twitter, and Reddit about the release (and constant updates) of the bot. As I am writing this article, the bot is serving a little over 3700 guilds/communities. I think that also says quite a bit about its popularity. Especially so given the fact that it’s not even six months old yet. The bot can pull detailed information on item sets, Skill Lines, Crown Store items, Guild Store items, and much more. What was the most challenging aspect of developing this tool? The bot itself wasn’t really a big challenge to build. The system that supplies the data, however, was. We’ve called this system “Beast.” The Dwemer Automaton itself does not hold any data. When a user types a command to the bot, the bot will ask Beast for the requested information. Beast will then answer to the Automaton, and the Automaton will in turn answer back to the user. Of course, the Automaton is not the only application that talks to Beast. Websites like eso-sets.com, eso-skillbook.com, and alcasthq.com all communicate with Beast in order to get relevant data to present to the user. Are you continuing to develop the bot? What kind of features or improvements do you intend to make in the future? The bot will always be developed further. Either with suggestions from users or our own ideas. Two things that are being looked at now are integrating fishing maps and Achievement guides. You’ve created a ton of unique ESO tools and websites, including eso-database.com, esoleaderboards.com, the ESO Raidplanner, and more. What drives you to keep creating these useful sites and apps? Everyone has his or her passions. Mine just happens to be programming. I enjoy the thought process of designing logical solutions to the community’s problems and needs. The community in turn enjoys what I build, and that is what this is all about – to make people’s lives easier. Where can the ESO community go to keep up-to-date on your work? The easiest ways are my Twitter account or my Discord server. However, other developers can also look at my Github page. 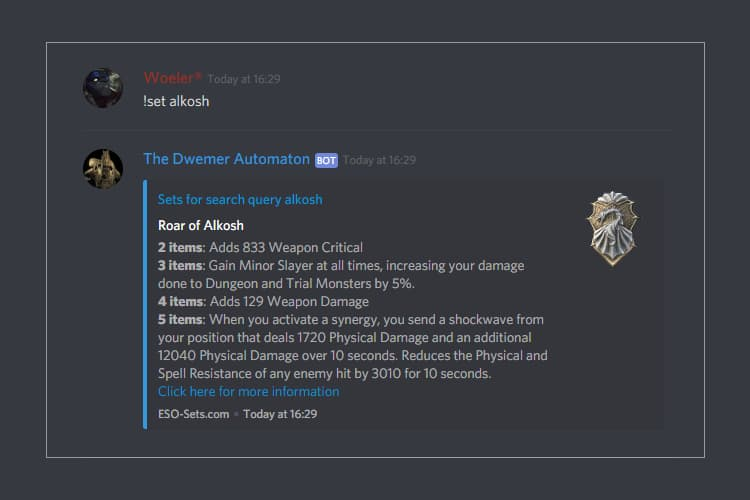 Thank you to Woeler for taking the time to talk to us about the Dwemer Automaton Discord bot and building so many useful tools for the whole ESO community! Have you enjoyed or created something related to The Elder Scrolls Online? Share it with us via @TESOnline, Instagram, or Facebook – we’d love to see it!